Sunday 21st August – at 7 oClock this morning we weighed anchor and shortly after received a black Pilot on board. Tis now two years since we visited this place, and I have almost forgotten its appearance. I am not inclined to entertain so high an opinion of its external aspects as I had previously entertained. Of the scenery around it, however my sentiments are unaltered. The Popa is a most remarkable object, wherever you see it from. Off the Town it presented this appearance of which the subjoined is a most rude and imperfect sketch, as you know very well that I possess no talents for drawing. The wind was unfavourable for our entering the Boca Chica, which I have mentioned in my former as being now the only entrance to the Harbour – but by making frequent tacks we entered, and came to the 1st portion of the Harbour as I have formerly described. My opinion of it was if possible heightened. The narrow entrance – the castle of San Fernando on your left, large, regular but ill manned, and that of San Joseph, small, built on an insulated rock, but running out low, like a tongue, form a pleasing introduction to the large Bay. After you have entered you cannot yet see the City of Carthagena but you have a fine prospect of the Popa under a different aspect. The left side of the 1st Bay is much finer in my opinion than the right. It is very elevated, covered with trees and luxuriant vegetation. There are several creeks & bays, and here and there are to be seen individual cottages or a rambling village peeping amidst the trees. In short it presents a very great variety of appearances. From the right side of the Bay we were at a great distance – it seemed partly low and partly elevated, with a greater appearance of cultivation. Around of us as we passed along numerous birds were whirling about in their aerial flight, and on the left shore we saw a flocks of 40 or 50 storks arranged in regular & close order at the waters edge, and apparently eying us on our way past them with great curiosity and interest. As you open up the City you soon reach the second Bay, where the land on your left is low and sandy, while that on your right is much more elevated. At 1 P.M. we came to our anchorage, and waited patiently for the visit.g Boat – for we had learned from the last Packet that as Small Pox prevailed at Kingston, we would be put into Quarantine for eight days. One hour – two hours had almost elapsed, there was no appearance of any boat, upon which our Commander gave orders for the gig to be lowered and the Master to be ready to go on shore. The Master was already seated in the boat & they were about to shove off, when a four oared Gig was descried pulling towards us, which turned out to be the Quarantine Boat, with M.r Watts the Consul’s son. The usual questions were asked of us, and we were simply told that we were in Quarantine for eight days, but left no person to see that we did not break the rules. We were only told to remove from our present anchorage farther off the City, right between two Magazine[s]. The wind not being favourable we did not start immediately, but waited till a change took place. During the interval we amused ourselves in the best way we could, and the attention of almost all was directed to an American Brigantine and two sloops, on board of which great bustle and activity prevailed. Two or three large boats were employed in conveying soldiers from one of the forts on board these. I do not know the exact number they conveyed but I should imagine two or three hundred. These troops were intended for Panama, where some disturbance had arisen against the existing government. I should not have liked to have been among them, as they were so crowded, & doubtless when they got to sea, most of them would be seasick. Monday 22nd August – very fine weather but very hot all day. Altho’ interdicted from going on shore on the City side, we were permitted to land on the small island, forming one side of the Boca Grande. This was named by the last Packet’s men Sober Island – no bad name. This morning I was eager to go on shore, and landed at the Powder Magazine, where we found one soldier who appeared before us in his shirt only. We observed with much curiosity the remains of several lines of batteries which I supposed were built when the English attacked the place on the occasion of which Roderick Randam speaks. Being impatient to traverse our Quarantine Island I strolled about, now walking fast, now stopping to examine the different trees, shrubs, & flowers, which were new to me. I pursued my way by a road close to the beach, where I in vain looked for shells or other marine curiosities. Insensibly I and the Mate had wandered on – there being no one to hinder us or to point out the boundaries of our liberty ground – till we came in sight of a hut village, which we entered & made some purchases there. We did not remain long but returned by the same road we came. The whole island seemed sandy. It was covered with umbrageous trees but of very moderate height. In many parts you could not penetrate into it on account of the thick wood or large patches of matter. I observed numerous beautiful birds and in particular immense flocks of paroquets which rose in the air with a horrible screaming. By the time I returned from my walk I was pretty well tired, and thirsty and was right glad to get on board where I could enjoy a cool air & be comfortable in every respect. From what I have said you ,may see that they are no ways direct in enforcing the Quarantine regulations and I verily believe we might land anywhere without a challenge or prohibition from anyone. If you give the old soldier a little, you may do what you like. For about eight days after our arrival we were kept in Quarantine, certainly not in durance vile. I was frequently on shore, and in the course of my rambles, I came to a small village, which along with several others, I entered. From this village an excellent road conducted you to Carthagena – and it was at our own option whether we would go thither or not – as nobody would have troubled their heads about us. Having however no special desire to visit the City, we claim no merit & no praise for our thus observing the Quarantine regulations. We found the people, all black, very civil indeed, and ready to oblige us as far as lay in their power. Do what we could, time lagged on our hands. Sometimes we went a fishing – sometimes a shooting – and sometimes from the mere love of locomotion. Every other [day] we had fresh provisions sent off from the Consul, so that we were in no danger of starving. The weather too was in our favour generally – being fair during the day and wet at night. At last on Monday 28th August – early in the morning we moved from the Quarantine pool to our old anchorage, and awaited with impatience the times, when we should obtain pratique. At 2 P.M. we observed the Health Boat advancing with a rapid speed, until she brought up alongside of us. The customary questions were put, and all the hands were piped to show themselves at the gangway, and when the officers were satisfied, they came on board, shook hands, and told us that we were free. Tis true, that all hands seemed to shew themselves – tis true that we had no small pox or other contagious diseases among us – but nevertheless there was one of our number, who did not shew himself – because he was confined to his cot. This was M.r Geach our Master. His symptoms at first exactly resembled the severe attack he had last voyage and which brought him to death’s door – but afterwards it assumed a different tho’ hardly less severe form. 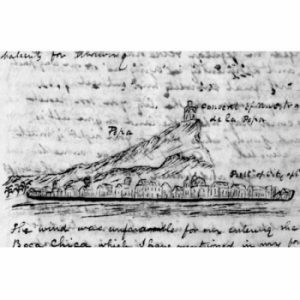 His disease, I believe, was brought on by his own imprudence in going on Sober Island, for the purpose of shooting, in a broiling hot day, with a heavy musquet and huge sea boots. Very fortunately we managed to keep him concealed, as otherwise no argument could have persuaded the Columbians but that he was ill of the small pox, and thus all hope of our open communication and consequently, of a good freight would have been lost. As soon as the Health officer had left us, the Commander went on shore, and at the same time the only passenger we had left us. Her name was Miss Mary Anne Crichton, an old acquaintance, being the very same lady who went over with us two years ago, and whom I stated to be the Chere amie of M.r Fowler, who had also been our passenger. Since our last voyage her protector had died suddenly from apoplexy, and left her not so well provided for, as she would have been, had he had time to make a will. She proved herself to be [a] very pleasant woman and according to our notions her peculiar situation would argue her to be not at all nice as to morality, there was nothing in her whole conduct, which could afford the slightest handle for scandal. In[deed] she during the whole time she was with us, she behaved with the Unitest propriety and greatly raised in my estimation that class of coloured females, which are so numerous in Jamaica. Miss Crichton had come to Carthagena to endeavour to arrange her pecuniary affairs, and to sell off a small property, of which she was possessed – but she was apprehensive that in consequence of the unsettled state of the country, she would not be able to obtain a tenth part of its real value.